Director On Call — What is Compassion Fatigue? Working in a funeral home, you are accustomed to death, but after a while even the most sympathetic person can be affected by what they see every day. Have you felt that your compassion has weakened over time? If so, then you need to know what compassion fatigue is. Compassion fatigue is a condition that individuals, such as funeral directors, who deal with the suffering of others can fall victim to. It is a type of post-traumatic stress disorder (PTSD) categorized as a secondary traumatic stress (STS) because although they are not directly experiencing the trauma, they are deeply affected by it. 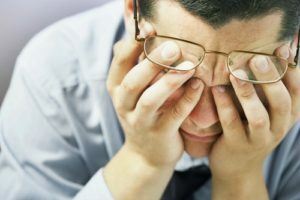 The symptoms associated with it are the results of chronic stress. Compassion fatigue is the decline in compassion for the suffering of others. No one in a care-giving situation is exempt, especially those working in funeral homes that see death in so many ways and the accompanying grief from loved ones. A person suffering from compassion fatigue will, due to either the compounding of traumatic events or one event that severely affects them, be physically and mentally incapable of being compassionate toward the pain and suffering of others. In a funeral home, this can mean equating others' emotions as unnecessary when not involving death. The main risk factor is being in an environment where you are exposed to the trauma of others on a regular basis, especially in stressful situations such as funeral homes. If you do not take care of yourself, you increase that risk. If you do not know how to cope well with adverse situations and are overly invested in others, you are also at a greater risk. Compassion fatigue keeps you from being yourself. It not only negatively affects your ability to work with the grieving families that need you; it also affects your personal and professional relationships. If you recognize any of these symptoms, seek help before things get out of control and you retreat into isolation.